Nato has reported an "unusual" increase in Russian military aircraft conducting manoeuvres over European airspace over the last two days. 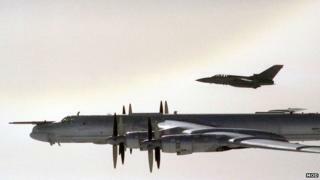 A Nato statement said four groups of aircraft, including Tu-95 Bear bombers and MiG-31 fighters, were tracked over seas and the Atlantic Ocean. Fighter aircraft from Norway, Britain, Portugal, Germany and Turkey were scrambled in response. Tensions between Russia and Nato states have soared over the Ukraine crisis. The US and EU imposed sanctions on Russia after its annexation of Ukraine's Crimean peninsula earlier this year. Ties have been further strained as the West has accused Russia of supporting rebels in eastern Ukraine - a charge Russia has denied. The Nato statement on Wednesday made no mention of Ukraine. It said that the "sizeable" Russian flights were unusual for their scale, although no incidents had been reported. The statement said Russian aircraft were detected flying over the Black Sea, the Baltic Sea, the North Sea and the Atlantic Ocean, prompting fighter jets from Nato member states to intercept and follow them. Overall, Nato said it had intercepted Russian aircraft more than 100 times so far this year - three times more than it did last year. "Scrambles and intercepts are standard procedure when an unknown aircraft approaches Nato airspace," the statement said. However, it said, such flights pose a potential risk to civilian aviation because the Russian military often does not file flight plans or use on-board transponders. "This means civilian air traffic control cannot detect these aircraft nor ensure there is no interference with civilian air traffic," the statement said.